When I taught in Soldotna, AK at the Kenai Peninsula Quilters in July, one of my students who was a nurse passed out sewing band-aids for everyone. I always joke about having liability insurance but not wanting any blood in my classroom! I’m a stickler for checking that my students close their rotary cutter blades every time they put their cutters down, even if they are going to pick them up right away. I tell them that they get one warning and then if I catch them again, they will be fined $5 which will go to the Mongolian Quilting Center! They laugh, but seriously, we need to respect these wonderful sharp rotary cutters that save us so much time and cut so cleanly and accurately. 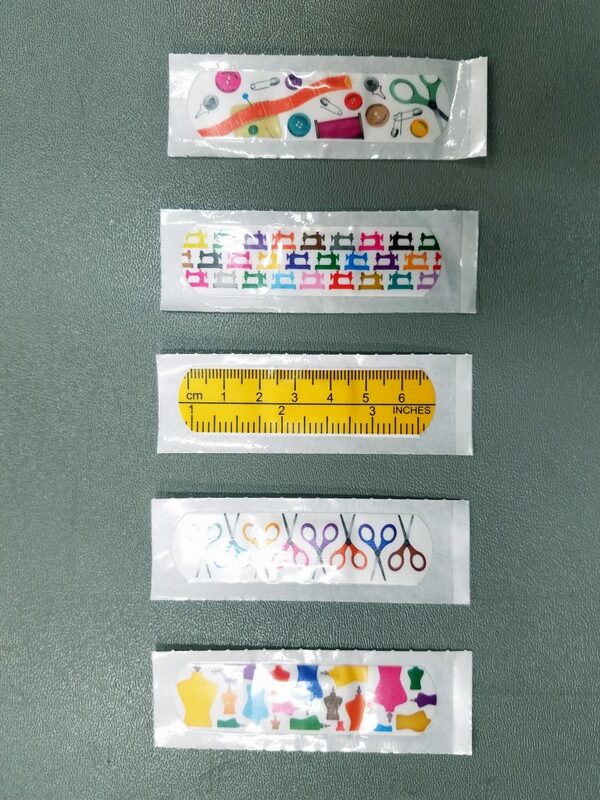 Here’s the selection of sewing band-aids. These really amused me. This entry was posted in Quilting tools and tagged tools by Maggie Ball. Bookmark the permalink.